4 Bedroom, 2 Bath, Living Room, Dining, Family Kitchen with eat-in breakfast area and island. Great flow, size and condition. Updated flooring, roof, HVAC and Pool. Spa-Like backyard with large covered patio. This beautiful home in a rare, small central Scottsdale gated community sits just above Camelback Rd (2 miles to Fashion Square). The home backs on Chessnut park, and the house sits higher for privacy. The owners have carefully designed and maintained the home to offer High ceilings, a unique custom open floor-plan, great flow, light, privacy, and large living-entertaining areas. It is ready to move in with neutral carpet and interior paint and low-maintenance porcelain tile. The kitchen boasts a gas cook top, eat-in dining area, loads of counter space with an added island opening to the family room and back yard. On the other side of the house, the Master and office/den/extra bedroom are seperated from the guest/kids rooms down the hall with a secondary door. Pebble finished spa-like pool with waterfall feature and low maintenance back yard with lounging areas. 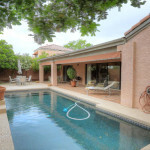 Down the road, update minimally to your specific taste and needs for a fabulous Scottsdale value.